We say goodby to Wendy and Leigh as they are going to stay at Lagoon Cove one more day in hopes of another salmon catch. 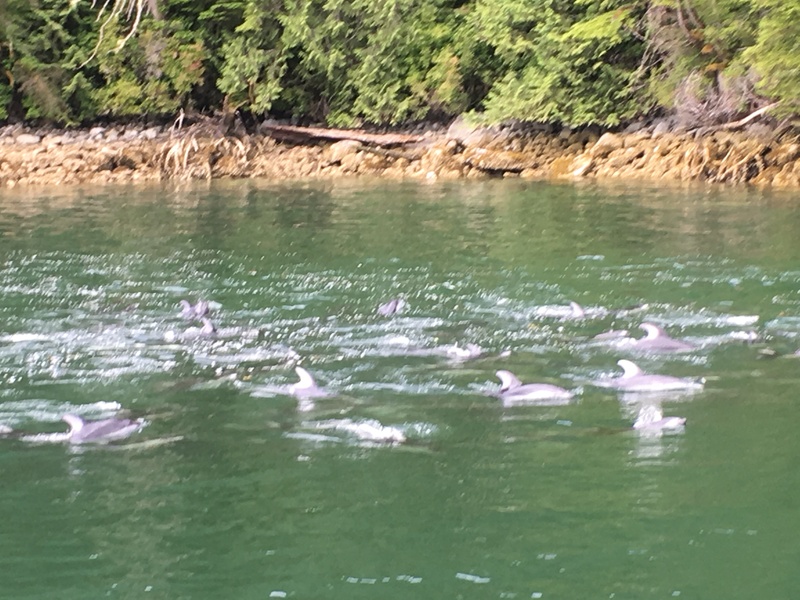 We travel up Knight Inlet for only a few miles before turning onto Tribune Channel. 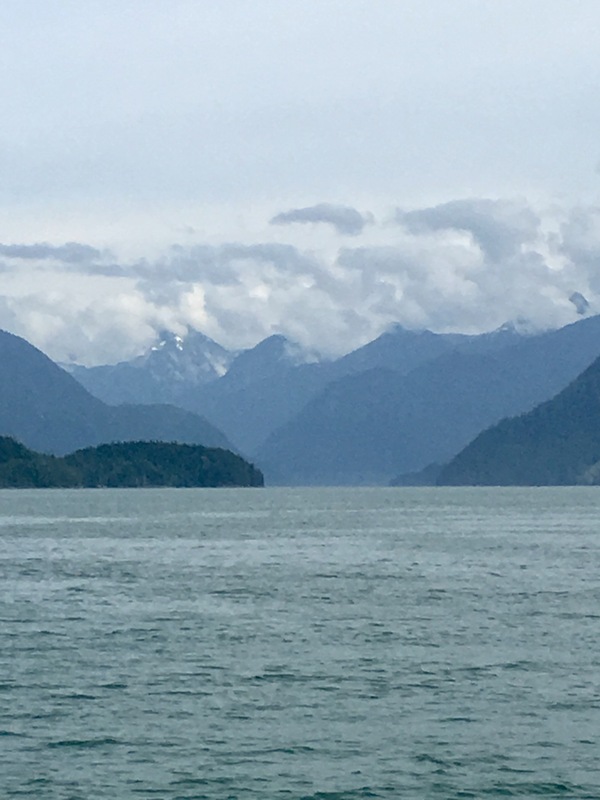 Knight Inlet continues for almost 70 miles and is the longest of the fjords along the B.C. Coast. The Bear Watching tour boats head up this channel daily for Grizzly Bear viewing. We will save this location for next year. 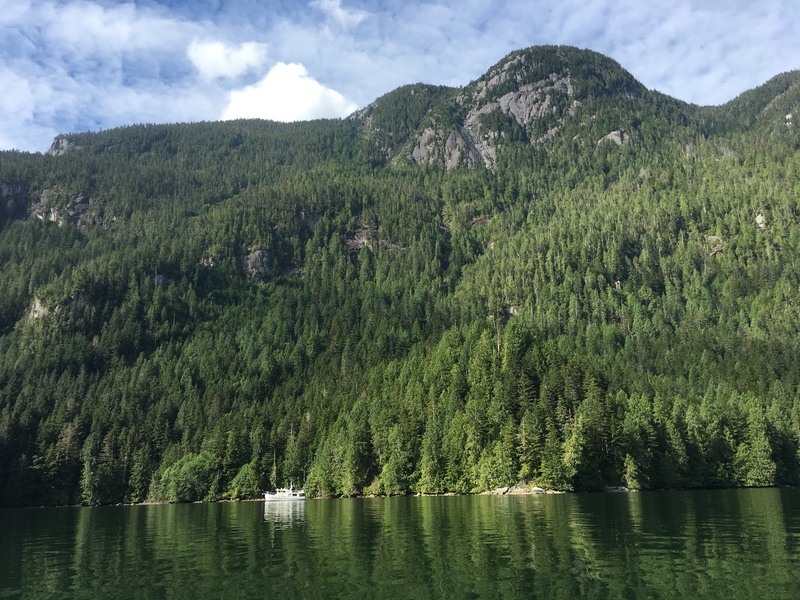 Our trip north up Tribune Channel is beautiful with three thousand foot heavily timbered slopes dropping down to the waters edge. We see numerous rock slide areas that have scared the mountain flanks. The deep 500 ft. waterway has turned aquamarine from the glacial runoff. Glimpses of snow covered peaks in the distance revel themselves through a partial cloud layer. We seem to be traveling alone today and see no other boats. It is a 25 mile trip to Kawatsi Bay. Entering the outer harbor, we see several power and sail boats on the small face dock of Kawatsi Bay Marina. Reaching the bowl shaped inner harbor, we are surrounded by magnificent mountains. There are no other boats in the anchorage and we have an easy time sounding the area. Most of the anchorage is very deep (100 + feet). This area is rocky with several landslides which makes for pour holding. We find a 60 foot shelf to drop the anchor close to shore. The anchor sets quickly and we feel secure. 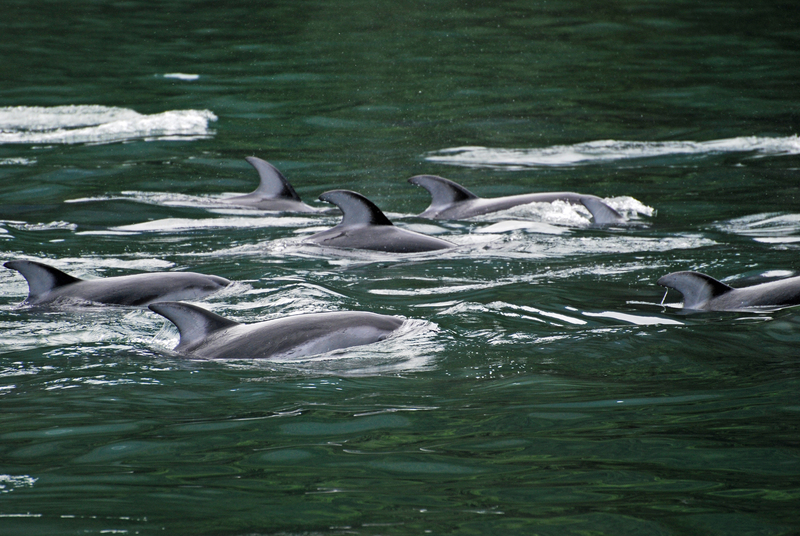 For the next few hours we are treated to a stunning water show by over 100 Pacific White Sided Dolphins. We have front row seats as they circle around the harbor in search of a meal. It is fascinating to see them work together in a very coordinated pattern. Several do summersaults and twists as they leap clear of the water. They seem to be having so much fun. We take a break from the dolphin show to dinghy over to the small marina. This is a no frills affair as there is no power or water just a place to tie your boat. There is not even a place for trash or recycling. It is operated by a husband and wife team who have found a way to live in this wilderness for the past 30 years. There is a pot luck dinner for marina guests every other night. 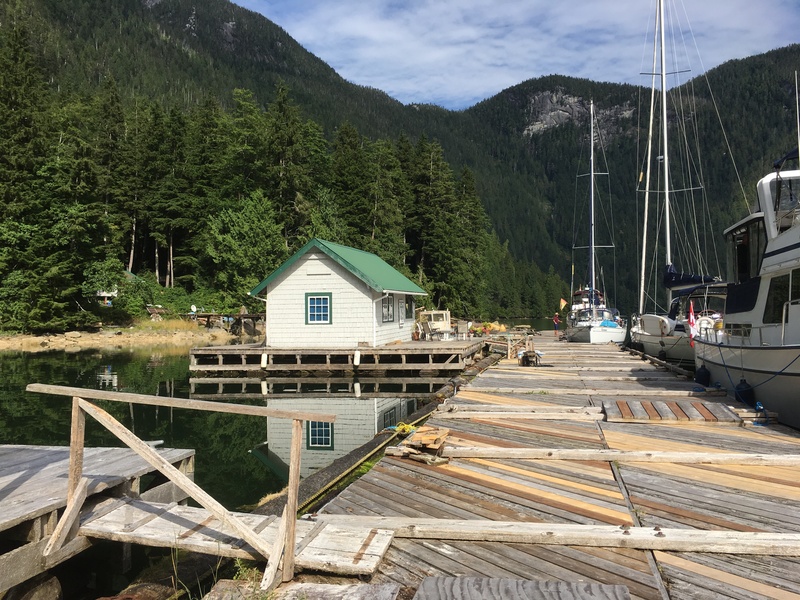 This is typical of the few marinas found in the Broughton Islands. Remember there are no roads, water, phone service, or electricity to these places. All supplies come by boat or sea plane. 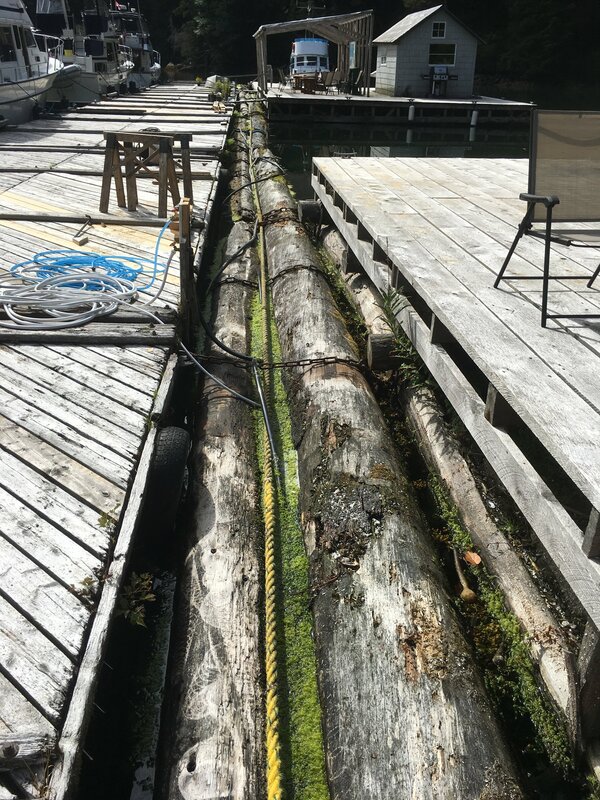 Their docks are constructed of massive fir logs cabled together. This too is a typical construction technique of the Broughtons. There is dock space for only five to six boats. The marina is full most nights during the summer as boaters return year after year to renew longstanding friendships. Just past the marina is a nice mile hike to Chatterbox Falls. We had planned on doing this but after being told that a Grizzly Bear had been spotted earlier in the day along the beach, we opt to save this hike for another time when we have guests aboard. Back a the boat, the dolphins continue to entertain us all evening. Kawatsi Bay will long be remembered as one of the highlights of our trip. This entry was posted on August 24, 2017 at 11:28 pm. You can follow any responses to this entry through the RSS 2.0 feed. You can leave a response, or trackback from your own site.